A recent trip north to the land of my paternal grandmother (yes, I’m a quarter Lancastrian) on a quest to see five of the remaining six “Deltic” diesel locomotives gathered in one place (I’m no trainspotter but these monsters took a hold on my imagination as a kid that remains today) also gave me the opportunity to sample a wide range of ales in some interesting bars and pubs in Manchester and in around Bury. While there are many worthwhile pubs in the vicinity, including historic gems such as Manchester’s famous Peveril of the Peak, I’ll focus on some of the more unusual ones here, in keeping with the leaning of this blog and lack of time and space to do the others justice. Two of these were bars in central Manchester notable for strong emphases on beer while breaking the normal rules of pubs. 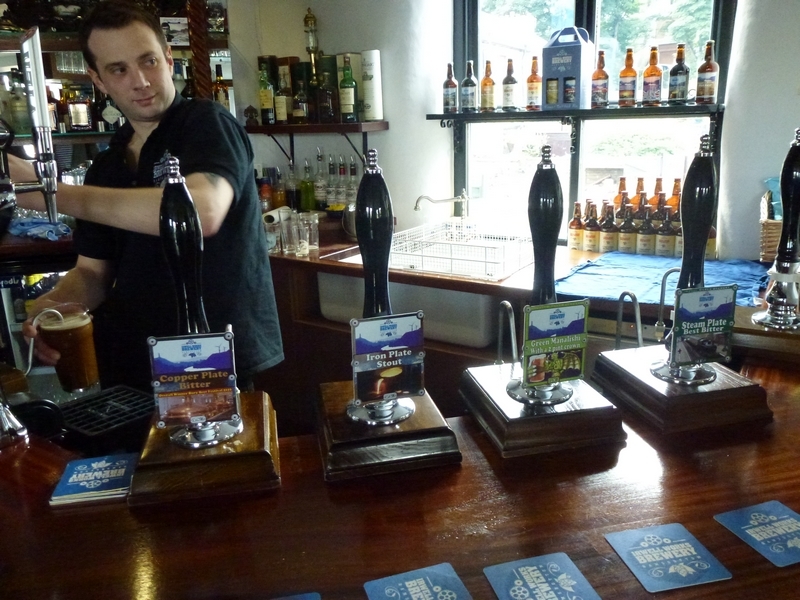 Another was an on-site brewery bar in Ramsbottom, just north of Bury, while the last was the station buffet at the Bury end of the preserved East Lancashire Railway. 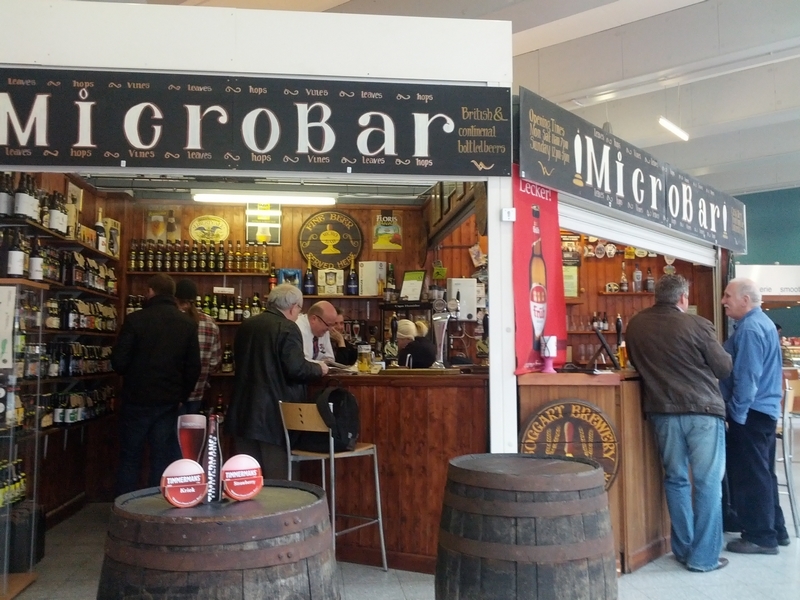 The first of the Manchester bars, Micro Bar, is situated among the Arndale Market’s boutique food and retail outlets inside the huge Arndale Centre shopping complex. It also keeps the same hours, meaning a visit here isn’t possible weekdays and Saturday after 6.00pm and 5.00pm on a Sunday. It’s also easily missed if you try to find it from the main shopping centre rather than from High Street, from which it’s clearly visible. 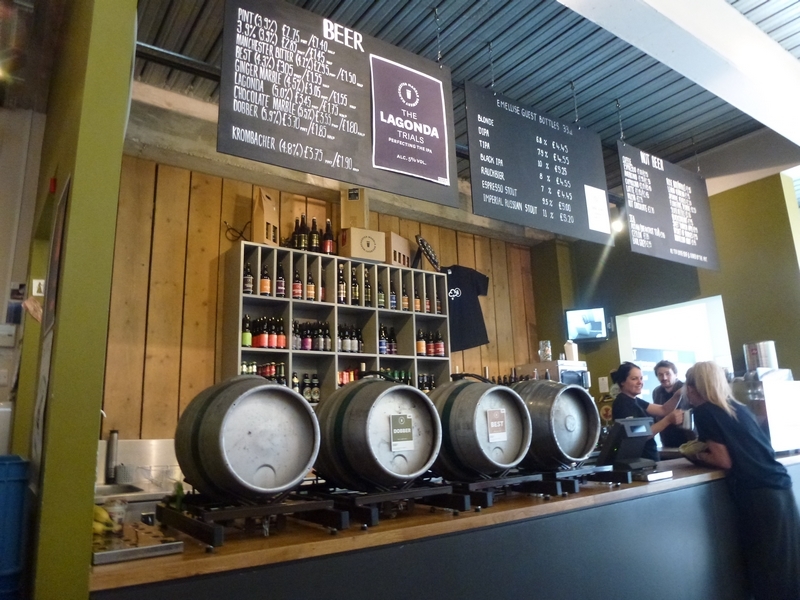 A regular outlet for the Boggart Brewery in nearby Newton Heath, Micro Bar typically stocks a couple of Boggart’s beers plus a couple of guests and a real cider. It’s also one for the best outlets for British and foreign bottled beers in Manchester itself, with bottles available to drink on the premises and to take home. You can also combine your pint with food from the many stands in the Market, in my case some tasty jerk chicken from Onje. Of the beers sampled, the first, Naylor’s Aire Valley Bitter (3.8%) from Naylor’s Brewery in West Yorkshire proved to be a decent session bitter, amber hued with biscuit flavours and a creamy nose, as well as serving as a good palate cleanser before the second course, Boggart Rum Porter (4.6%). A former gold medal winner at the huge Peterborough Beer Festival, Boggart Rum Porter lived up to its billing fusing a demerara rum character with the deep roasty flavours of a good porter. After the porter it was time to move on – an intention to go back and pick up a couple of bottles didn’t come to fruition – to another unusual beer outlet, Marble Brewery’s 57 Thomas Street bar just north of Piccadilly Station and not far from Micro Bar. Marble, based in the Ancoats district north of the city centre, has become well known over the past few years both for its extensive range of well-crafted, and usually puckeringly bitter, ales and its excellent and convivial Marble Arch brewery tap nearby (which I’ve visited previously). But only at 57 Thomas Street – a compact and modern beer bar with a large glass frontage rather than a pub in the usual sense – are the beers routinely served on gravity direct from barrels on the bar with up to four available at any time. On this occasion the beers on offer included the brewery’s aromatic and strikingly bitter take on traditional best bitter Marble Best (4.3%) and the light-bodied, pale but potent Dobber (5.9%). The specially imported barrel cooling system (from Belgium I was told) kept both beers at the perfect temperature without ugly jackets. And without meaning to sound too southern, serving this way opened up whole new flavour vistas in Marble’s ales for me, the natural effervescence of the beer having not been sacrificed for the turbid pour and prized tight collar of foam so beloved of beer drinkers in the north of England. The result was bolder and more distinct flavours – if perhaps less well-integrated – beneath a loose layer of bubbles, the Best being especially vibrant and outstandingly hoppy, the Dobber creamy, hoppy and warming in equal amounts. The method of dispense did, however, occasionally raise questions from customers as to the beer being served flat, I was told. I hope Marble’s education programme expands the availability of gravity dispensed beer in the city. It certainly works well here. I was also persuaded to take away a bottle of the Marble’s 1888 Ginger Stout (6.5%) to add to the limited edition Old Manchester (a 7.3% IPA brewed together with Fullers head brewer John Keeling, a Manchester native) I already have at home. As with Micro Bar, 57 Thomas Street also sold a wide range of foreign bottled beers, mainly Belgian and German for consumption on or off site. The next day took me out to Bury and the East Lancashire Railway, from where I travelled the trains up and down the line stopping off to visit a number of other Lancashire watering holes during the day, using the railway’s useful Real Ale Trail guide as a guide. While I’ll save the most unusual of these for my next post, among the others visited was the Irwell Works Brewery in Ramsbottom. The Irwell Works Brewery is situated in a Victorian former engineering works building and features a cosy brewery tap/bar in the upstairs room above the brewery. On tap during my visit was the full range of the brewery’s beers, including the low strength Lightweights & Gentlemen (3.2%) and Copper Plate Best Bitter (4.3%), both in cask and bottle. But it was the darker brews that drew me, the Tin Plate Dark Mild (3.6%) a near-black roasty mild with that characteristic northern creaminess and the Iron Plate Lancashire Stout (4.4%), which nicely counterbalanced its darker ambitions with a subtle sweetness and even offered whisky-like notes as it slipped won. Quite satisfying. 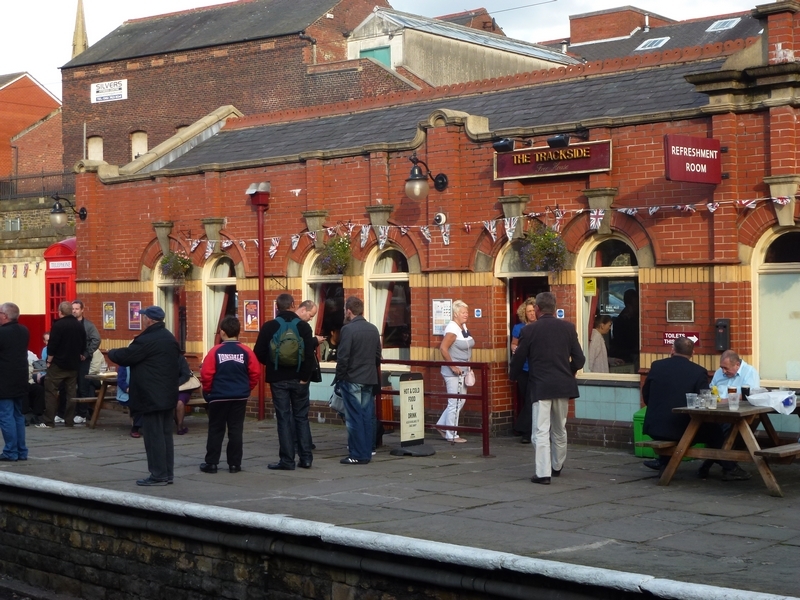 I ended the day’s sampling at The Trackside pub situated next to the platform at Bury Bolton Street railway station, a regular Good Beer Guide favourite. The impressive list of nine real ales included a couple of special brews dedicated to the aforementioned Deltic locomotives. But again I was looking for something a little darker and opted for the Fuzzy Duck Brewery’s Mucky Duck (4.0%) from Poulton-le-Fylde near Blackpool and the Red (4.4%) from the local Outstanding Brewing Co. The Mucky Duck was a slightly sweet, quaffable but still roasty stout while the Red offered a suitably autumnal, toasty, red-amber brew perfect for fireside drinking. On balance, the gravity-dispensed Marble Best at 57 Thomas Street was the standout beer of my trip, no doubt reflecting the three quarters of me that’s southern (well that’s not strictly true although I certainly hail from the south). I headed back to my hotel in Manchester on the Metrolink a happy, and slightly inebriated, chappy.